Top iPhone/Apple Black Friday Deals To Watch For! Here in the Great White North, traditionally Boxing Day is the biggest shopping day of the year. In the USA, our neighbours celebrate Black Friday as one of the most important retail periods of the year! Black Friday is seen as the start of the Christmas shopping season. The joy has spread over to us Canuckle-heads since most companies now ship to Canada. Even companies that don’t ship to Canada, we’ll find ways to buy buy buy anyways! 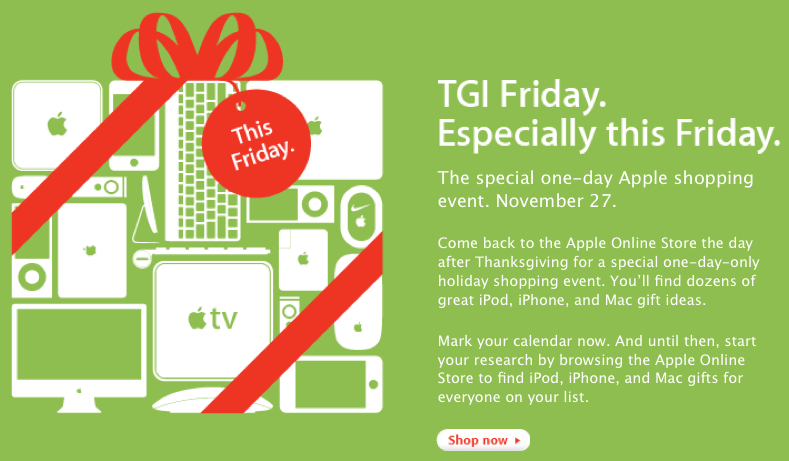 One of our insiders has received an internal email confirming Black Friday sales IN STORE at Apple Store locations across Canada. We know that there will be Black Friday sales online, but in store would be a great compliment. The email essentially was translated into “get ready for madness this weekend”. Sounds like fun to me! 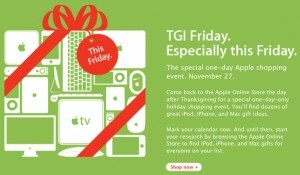 Here is a list of some worth Black Friday “deals” related to the iPhone, Mac and DEALS in general! Feel free to add suggestions in the comments if you have some killer deals we all should know about! ZAGGskins – 50% off sale until November 30th only! Read our review here! 1Password Pro for iPhone – Currently FREE. Regular price, $7.99. Click here to download! Podium iPhone Stands – $29 sale on Pearl and Carbon Podium stands for iPhone 3G/3GS and iPod Touch! Click here to read our reviews. OtterBox Commuter Series Cases: 10% OFF on Monday on any Commuter Series iPhone 3G/3GS case. Click here to read our review! RichardSolo – 50% off RichardSolo iPhone battery backup! $27.48, free shipping to Canada! (Shazam) RED – They joined with the RED program. 20% of every $4.99 sales goes towards HIV/AID support in Africa! Co-Pilot Live Turn by Turn iPhone GPS – On sale for $19.99! This is my favourite turn by turn GPS, works amazingly well. * Tiger Woods Golf ($4.99->$2.99) – This is my favourite game at the moment! Not Your Average iPhone Book – Give Yourself a (Jail)break: This massive 80 page eBook is dedicated to everything you must know before jailbreaking your iPhone. Great for beginners who are late the whole “jailbreaking” game. Well written with lots of visuals! Only $7, price won’t last long! Read our review here. Doubleday Book Club Canada – Stephen King, Danielle Steele, John Grisham – Get 5 of the best-selling books for only $1! Join today for an extra free book! Dell Canada – 96 hours of Black Friday Deals! Save up to 65% on select Electronics and Accessories; sale ends Monday! 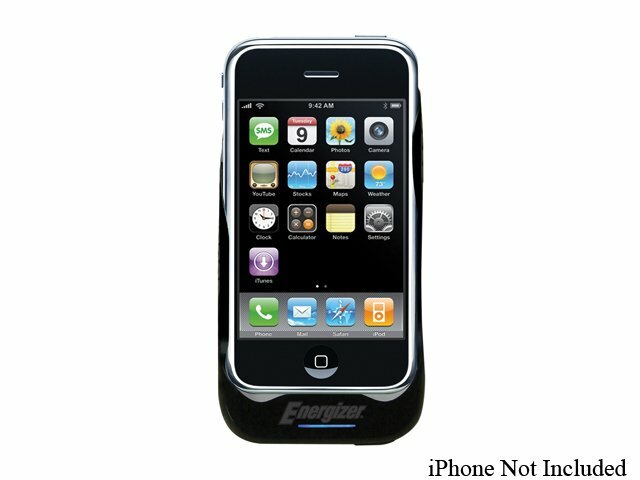 NewEgg.ca – Energizer Lithium Battery iPhone Case $20.99 (savings of $63!!). This is a HOT deal for a backup battery and case. Cheaper than a Mophie Juicepack which retails for $99US! Plus TWO pages of NewEgg.ca Black Friday deals on various Electronics! Expedia.ca: Ends soon! Get $25 off a 2+ nights hotel stay. Use code CASave25 at checkout! Gameloft iPhone Games: $0.99 games until November 29th! Phew! Are you excited about Black Friday in Canada? Let us know where you’ll be shopping in the comments!